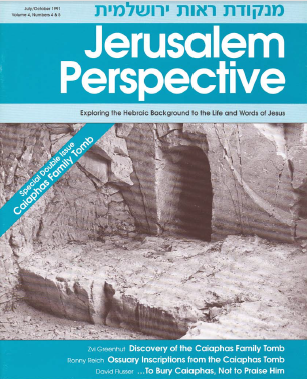 The fifty-six issues of the print edition of Jerusalem Perspective magazine were published between 1987 and 1999. Though they are no longer available in print form, each of the issues is now freely available in PDF format for all readers. Below is a list of each magazine and their associated articles. To access the PDF files click on the image of each issue. Clicking on the title of an issue will bring you to the versions of the articles from that issue that are now online. David Bivin, “Fresh Insight into Jesus’ Words,” p. 1; Rabbinic Parallels: David Bivin, “The Harvest” [Mt. 9:37-38; Avot 2:15], pp. 1-2; David Bivin, “A Gospel in Hebrew?” p. 2; Hebrew Nuggets, Lesson 1: David Bivin, “Jesus’ Hebrew Name (Part 1)” [Mt. 5:18; Gen. Rabbah 10:1; Exod. Rabbah 6:1], p. 3; David Bivin, “Jesus, a Jewish Bachelor?” [Yevamot 6:6; Tosefta, Yevamot 8:7], p. 4. David Bivin, “Semitic Background to the Nain Story” [Lk. 7:11-17], pp. 1-3; David Bivin, “Evidence for Jesus’ Judean Ministry”[Lk. 7:17; War 4:511-513], pp. 1-2; Hebrew Nuggets, Lesson 2: David Bivin, “Jesus’ Hebrew Name (Part 2),” p. 3; David Bivin, “‘Prophet’ as a Messianic Title” [Lk. 1:32; 7:16; 9:35; Deut. 18:15; Eccl. Rabbah 1:9; Acts 3:22; 7:35, 37; Mechilta on Exod. 13:19; Tanhuma, Toledot 20; Num. 12:7; 1 Macc. 14:41; Heb. 3:1-6; ], pp. 3-4. David Bivin, “’Amen’: Introduction or Response?” pp. 1-2; David Bivin, “Translating the Gospels to Hebrew” [Eusebius, Ecclesiastical History III 39.16], pp. 1-2; Hebrew Nuggets, Lesson 3: David Bivin, “Jesus’ Hebrew Name (Part 3),” p. 3; David Bivin, “Written and Oral Torah,” p. 4. David Bivin, “Did Jesus Observe the Oral Torah?—Jesus’ Jewish Understanding of Blessing,” pp. 1-2; Hebrew Nuggets, Lesson 4: David Bivin, “Jesus’ Hebrew Name (Part 4),” p. 3; David Bivin, “Jesus’ Use of ‘Amen,’” p. 4. David Bivin, “Jesus and the Oral Torah: The Unutterable Name of God,” pp. 1-2; David Bivin, “The Syndicated Donkey” [Lk. 19:33], pp. 1-2; Hebrew Nuggets, Lesson 5: David Bivin, “Abba (Part 1),” p. 3; “The Jerusalem School” (based on an interview with David Bivin conducted by Yishai Eldar), p. 4. David Bivin, “Preview of the Jerusalem Synoptic Commentary: ‘Destroy’ the Law” [Mt. 5:17], pp. 1, 4; David Bivin, “Jesus and the Oral Torah: Tithing,” pp. 1-2; Hebrew Nuggets, Lesson 6: David Bivin, “Abba (Part 2),” p. 3. David Bivin, “Jesus and the Oral Torah: ‘The Hem of His Garment’” [Mt. 9:20-21], pp. 1-2; David Bivin, “Hebraic Heritage: The Beginning of the Jerusalem School,” pp. 1-2; Hebrew Nuggets, Lesson 7: David Bivin, “Abba (Part 3),” p. 3; David Bivin, “The Queen of Teman” [Lk. 11:31], p. 4. David Bivin, “Principles of Rabbinic Interpretation: kal va·H|O·mer (Part 1),” pp. 1-2; David Bivin, “Jesus and the Oral Torah: Tefillin,” pp. 1-2; Hebrew Nuggets, Lesson 8: David Bivin, “Abba (Part 4),” p. 3; David Bivin, “How Long Was Jesus in the Tomb?” [Mt. 28:1], p. 4. David Bivin, “Was Jesus a Rabbi?” pp. 1-2; Weston W. Fields, “‘Salted with Fire’” [Mk. 9:49], pp. 1-2; Hebrew Nuggets, Lesson 9: David Bivin, “Hallelujah (Part 1),” p. 3; David Bivin, “Principles of Rabbinic Interpretation: kal va·H|O·mer (Part 2),” p. 4. Brad H. Young, “The Lord’s Prayer: ‘Our Father Who Art in Heaven,’” pp. 1-2; David Bivin, “The Traveling Sage,” pp. 1, 4;Hebrew Nuggets, Lesson 10: David Bivin, “Hallelujah (Part 2),” p. 3; David Bivin, “Jerusalem School Objectives,” p. 4. David Bivin, “At the Feet of a Sage,” pp. 1-2; Brad H. Young, “The Lord’s Prayer: ‘Hallowed Be Thy Name,’” pp. 1-2; Hebrew Nuggets, Lesson 11: David Bivin, “Hallelujah (Part 3),” p. 3; David Bivin, “Discovering Longer Gospel Stories,” p. 4; Sidebar: “A Conjectured Process of Gospel Transmission,” p. 4. David Bivin, “The Mary and Martha Story,” pp. 1, 4; Brad H. Young, “The Lord’s Prayer: ‘Thy Kingdom Come’ (Part 1),” pp. 1-2; David Bivin, “Gospel Translation” [Mt. 16:19], p. 2; Hebrew Nuggets, Lesson 12: David Bivin, “Menorah (Part 1),” p. 3. David Bivin, “First-century Discipleship,” pp. 1-2; Brad H. Young, “The Lord’s Prayer: ‘Thy Kingdom Come’ (Part 2),” pp. 1, 4;Hebrew Nuggets, Lesson 13: David Bivin, “Menorah (Part 2),” p. 3; David Bivin, “Who Was Jesus?” p. 4. David Bivin, “Jesus’ Education (Part 1),” pp. 1, 4; Brad H. Young, “The Lord’s Prayer: ‘Thy Will Be Done,’” pp. 1-2; Hebrew Nuggets, Lesson 14: David Bivin, “Menorah (Part 3),” p. 3; “International Synoptic Society,” p. 4. Robert L. Lindsey, “Sources for the Gospels,” pp. 1-2; Brad H. Young, “The Lord’s Prayer: ‘Forgive Us Our Debts,’” pp. 1, 4;Hebrew Nuggets, Lesson 16: David Bivin, “Shalom (Part 2),” pp. 3-4. Shmuel Safrai, “A Priest of the Division of Abijah,” pp. 1-2; Robert L. Lindsey, “Early Gospel Texts,” pp. 1, 4; Hebrew Nuggets, Lesson 17: David Bivin, “Vav (Part 1),” p. 3; Brad H. Young, “The Lord’s Prayer: ‘Lead Us Not Into Temptation,’” p. 4. Shmuel Safrai, “Zechariah’s Prestigious Task,” pp. 1, 4; Robert L. Lindsey, “How the Gospel Writers Worked,” pp. 1-2;Hebrew Nuggets, Lesson 18: David Bivin, “Vav (Part 2),” p. 3; Sidebar: “Hebrew Reconstruction of the Lord’s Prayer,” p. 4. Robert L. Lindsey, “The Synoptic Problem: Laying the Groundwork,” pp. 1-2; Shmuel Safrai, “John the Nazirite,” pp. 1, 4;Hebrew Nuggets, Lesson 19: David Bivin, “Israel (Part 1),” p. 3. Shmuel Safrai, “Naming John the Baptist,” pp. 1-2; Robert L. Lindsey, “The Synoptic Problem: Gospel Similarities,” pp. 1, 4;Hebrew Nuggets, Lesson 20: David Bivin, “Israel (Part 2),” p. 3. Readers’ Perspective: David Bivin on the question, “Why leave out the Gospel of John?” p. 2; Shmuel Safrai, “Pilgrimage in the Time of Jesus,” pp. 3-4, 12; Sidebar: David Bivin, “Pilgrim’s Graffito,” p. 4; Sidebar: David Bivin, “Synagogue Guest House for First-century Pilgrims,” p. 5; David Bivin, “Hebrew Idioms in the Gospels,” pp. 6-7; Mendel Nun, “Fish and the Sea of Galilee,” pp. 8-9; Robert L. Lindsey, “The Markan Cross-Factor,” pp. 10-11; Hebrew Nuggets, Lesson 22: David Bivin, “Israel (Part 4),” p. 13; Book Review: Marvin Wilson’s Our Father Abraham: Jewish Roots of the Christian Faith, reviewed by David Pileggi, p. 14. Readers’ Perspective: David Bivin on Rudolf Bultmann’s insistence that it is impossible to reach the historical Jesus through the Gospels, pp. 2, 14; Mendel Nun, “The Kingdom of Heaven Is Like a Seine,” pp. 3-4; David Pileggi, “A Life on the Kinneret” [short biography of fisherman Mendel Nun], p. 5; The Meturgeman [translator]: Randall Buth, “The Sons of His Will” [Lk. 2:14], pp. 6-7; Shmuel Safrai, “Synagogue and Sabbath,” pp. 8-10; Hebrew Nuggets: David Bivin, “Transliteration System [used in JERUSALEM PERSPECTIVE],” p. 11; David Bivin, “‘Binding’ and ‘Loosing’” [Mt. 16:19], pp. 12-13; Sidebar: “Gennesaret According to Josephus,” p. 14. Readers’ Perspective: David Bivin on the “Jesus Seminar,” p. 2; and Shmuel Safrai on whether Jews of the first century knew their tribal affiliation, pp. 2, 14; Shmuel Safrai, “The Centurion and the Synagogue,” pp. 3-5; Robert L. Lindsey, “The Kingdom of God: God’s Power Among Believers,” pp. 6-8; Sidebar: Shmuel Safrai, “Note to Robert Lindsey, ‘The Kingdom of God: God’s Power Among Believers,’” p. 8; The Meturgeman [translator]: Randall Buth, “Your Money or Your Life” [Lk. 20:25], pp. 9-10; Mendel Nun, “‘Let Down Your Nets’” [Lk. 5:4], pp. 11-13; Sidebar: Mendel Nun, “The Cast-Net,” p. 13. Readers’ Perspective: David Bivin on why JERUSALEM PERSPECTIVE avoids the term “Old Testament,” pp. 2, 15; and Shmuel Safrai on why Jesus said, “Pray that your flight will not be on the Sabbath” [Mt. 24:20], p. 15; Mendel Nun, “Fish, Storms and a Boat,” pp. 3-5; Shmuel Safrai, “A Friend of Tax Collectors,” pp. 6-7; R. Steven Notley, “Who Questioned Jesus?” [Lk. 22:66], pp. 8-10; The Meturgeman[translator]: Randall Buth, “Jesus’ Most Important Title,” pp. 11-15. David Flusser, “Jesus and the Essenes (Part 1),” pp. 3-5, 13; Hebrew Nuggets, Lesson 23: David Bivin, “Messiah (Part 1),” p. 6; The Meturgeman [translator]: Randall Buth, “What Kind of Blessing Is That?” [Lk. 2:34-35], pp. 7-10; David Bivin, “Views of the Jerusalem School,” p. 11; Book Review: Michael Hilton and Gordian Marshall’s The Gospels and Rabbinic Judaism: A Study Guide, reviewed by Stephen Schmidt, pp. 12-13; Gospel Postcard: Halvor Ronning, “The Sea of Galilee,” p. 14. Readers’ Perspective: Ray Pritz on the trustworthiness of Jerome’s claim that he saw a Hebrew gospel, pp. 2, 15; Shmuel Safrai, “Sabbath Breakers?” [Lk. 6:1-5], pp. 3-5; Sidebar: David Bivin, “Ears of Corn?” p. 5; David Flusser, “Jesus and the Essenes (Part 2),” pp. 6-8; David Pileggi, “Who Were the Essenes?” pp. 9-10, 15; Hebrew Nuggets, Lesson 24: David Bivin, “Messiah (Part 2),” p. 11;Book Review: David Flusser’s The Spiritual History of the Dead Sea Sect, reviewed by Stephen Schmidt, p. 12; Gospel Postcard: Halvor Ronning, “Kefar Nahum [Capernaum],” pp. 13, 15; David Bivin, “Has a Hebrew Gospel Been Found?” p. 16. Readers’ Perspective: Ray Pritz on whether the first Christians were Saturday or Sunday-keepers, pp. 2, 15; Ray Pritz, “The New Testament in Modern Hebrew,” pp. 3-4; Ray Pritz, “Who Is a Jew in the Gospels?” pp. 5-6; Sidebar: David Bivin, “If King David were alive today, could he communicate with President Herzog?” p. 6; David Pileggi, “The Library at Qumran,” pp. 7-9; The Meturgeman [translator]:Randall Buth, “Matthew’s Aramaic Glue,” pp. 10-12; Book Review: Michael Sokoloff’s A Dictionary of Jewish Palestinian Aramaic of the Byzantine Period, reviewed by Randall Buth, pp. 12, 15; Hebrew Nuggets, Lesson 25: David Bivin, “ta·NAK [the Jewish Bible] (Part 1: Torah),” p. 13; Rabbinic Parallels: David Bivin, “Parables and Foundations” [Mt. 7:24-27], p. 14. Readers’ Perspective: Stephen Schmidt on the gender of God, p. 2; Shmuel Safrai, “Master and Disciple,” pp. 3-5, 13; David Flusser, “The Decalogue and the New Testament,” pp. 6-10, 15; David Flusser, “Sefer Pitron Torah,” p. 11; Ray Pritz, “The Holy Spirit in the Hebrew New Testament,” pp. 12-13; Sidebar: David Bivin, “The Intricacies of Hebrew Gender,” p. 13; Hebrew Nuggets, Lesson 26: David Bivin, “ta·NAK [the Jewish Bible] (Part 2: Prophets),” pp. 14-15. 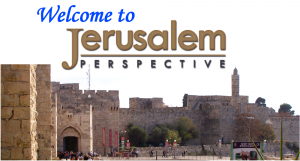 Readers’ Perspective: David Bivin on why JERUSALEM PERSPECTIVE uses the Greek name “Jesus” instead of the Hebrew “Yeshua,” pp. 2, 15; Shmuel Safrai, “Spoken Languages in the Time of Jesus,” pp. 3-8, 13; David Pileggi, “The Bar Kochva Letters,” pp. 9-11; The Meturgeman [translator]: Randall Buth, “What Is the Priest Doing? Common Sense and Culture” [Lk. 1:21-22], pp. 12-13; Hebrew Nuggets, Lesson 27: David Bivin, “ta·NAK [the Jewish Bible] (Part 3: Writings),” pp. 14-15. Readers’ Perspective: David Bivin on what Jesus meant when he said, “Call no man your father on earth” [Mt. 23:9], pp. 2, 12, and on why “Messiah,” not “Christ,” should be used in New Testament translations, p. 12; Shmuel Safrai, “Literary Languages in the Time of Jesus,” pp. 3-8; Ray Pritz, “The Divine Name in the Hebrew New Testament,” pp. 10-12; The Meturgeman [translator]: Randall Buth, “‘And’ or ‘But’—So What?” pp. 13-15. The Work of Robert L. Lindsey: “Perspective on Robert Lindsey,” p. 2; David Bivin, “A New Solution to the Synoptic Problem,” pp. 3-5; Book Review: R. Steven Notley, “Unearthing Literary Strata” (a review of Robert L. Lindsey’s A Comparative Greek Concordance of the Synoptic Gospels), pp. 6-9; Sidebar: “According to Prof. Flusser” (David Flusser on Lindsey’s synoptic theory), p. 10; Randall Buth, “Pursuing Righteousness” [Mt. 5:10], pp. 11-12, 15; Book Review: Robert L. Lindsey’s Jesus Rabbi & Lord: The Hebrew Story of Jesus Behind Our Gospels, reviewed by Randall Buth, p. 13; Book Review: Robert L. Lindsey’s The Jesus Sources: Understanding the Gospels, reviewed by Joseph Frankovic, p. 14. Readers’ Perspective: David Bivin on the translation of hades in Luke 16:23, pp. 2, 15; and Shmuel Safrai on the date of Shavuot (Pentecost), p. 15; Ray Pritz, “‘He Shall Be Called a Nazarene’” [Mt. 2:23], pp. 3-4; David Bivin, “‘Jehovah’—A Christian Misunderstanding,” pp. 5-6; Sidebar: David Bivin, “Meaning of the Unutterable Name,” p. 6; David Bivin, “The Fallacy of Sacred Name Bibles,” pp. 7, 12; Jewish Perspective: Shmuel Safrai, “No Room in the Inn?” [Lk. 2:7], p. 8; Marvin R. Wilson, “The Shema in Early Jewish Teaching,” pp. 9-10; Hebrew Nuggets, Lesson 28: David Bivin, “Reading with Grace,” pp. 11-12; Rabbinic Parallels: David Bivin, “A Measure of Humility” [Lk. 14:11], pp. 13-14. Readers’ Perspective: David Bivin on the question of canon and authority of Scripture, pp. 2, 15; The Meturgeman[translator]: Randall Buth, “Inspiration, History and Bible Translation,” pp. 3-7; Ray Pritz, “Reconstructing the Words of Jesus,” pp. 8-9; Sidebar:David Bivin, “Scirbal Scribal Errors,” p. 9; Ray Pritz, “New Testament Canon,” pp. 10, 15; Jewish Perspective: Shmuel Safrai, “Did Jesus Wear aKippah?” p. 11; Marvin R. Wilson, “The Sweetness of Learning,” pp. 12-13; Hebrew Nuggets, Lesson 29: David Bivin, “Grace Compared,” pp. 14-15. Shmuel Safrai, “The Place of Women in First-century Synagogues,” pp. 3-6, 14; The Meturgeman [translator]: Randall Buth, “That Small-fry Herod Antipas, or When a Fox Is Not a Fox” [Lk. 13:32], pp. 7-9, 14; Chana Safrai, “Jesus’ Jewish Parents,” pp. 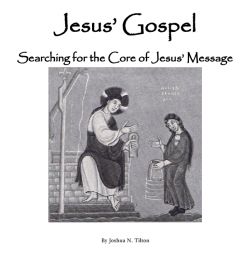 10-11, 14-15; Joseph Frankovic, “Pieces to the Synoptic Puzzle: Papias and Luke 1:1-4,” pp. 12-13. Readers’ Perspective: Robert Lindsey on what his synoptic conclusions mean for the average reader of the Gospels, pp. 2, 15; Robert L. Lindsey, “Jesus’ Twin Parables,” pp. 3-5, 12; Sidebar: “Lindsey’s Assumptions,” p. 4; Sidebar: “Jesus’ Parables and Their Contexts” (a list of sixteen “contextual reconstructions”), p. 6; The Meturgeman [translator]: Randall Buth, “John’s Targumic Allusions” [Jn. 1:1-18], pp. 7-9, 12; Sidebar: Randall Buth, “Scholarly Attitudes to John,” p. 9; Marvin R. Wilson, “The Appearance of Jesus: Hairstyles and Beards in Bible Times,” pp. 10-12; David Bivin, “Rabbinic Literature: A Spiritual Treasure,” pp. 13-15. David Bivin, “Jesus’ View of Pacifism,” pp. 3-6; Marvin R. Wilson, “Hospitality: Heritage of the Church,” pp. 7-8; David Bivin, “Jesus’ Attitude Toward Riches,” pp. 9-11, 13; Joseph Frankovic, “Is the Sage Worth His Salt?” pp. 12-13; Rabbinic Parallels: David Bivin, “King Parables,” pp. 14-15. Readers’ Perspective: Shmuel Safrai on women and ritual purity, pp. 7-8; Anna Iamim, “The Right to Reign” [the genealogy of the house of Herod the Great: Antiq. 18:130-132], pp. 10-17; Gospel Flora: Gloria E. M. Suess, “Lilies of the Field” [Mt. 6:28], pp. 18-23;Thinking Like the Sages: Joseph Frankovic, “Remember Shiloh!” [Lk. 19:46; Isa. 56:7; Jer. 7:11], pp. 24-31; Sidebar: Joseph Frankovic, “Where Were the Vendors?” [Berachot 9:5; Middot 1:3], p. 29; David Bivin, “Matthew 16:18: The Petros-petra Wordplay—Greek, Aramaic, or Hebrew?” [Mt. 16:18; Yalkut Shim’oni to Num. 23:9], pp. 32-36, 38. Readers’ Perspective: Mendel Nun on apparent problems in the text of John 21, p. 7; Mendel Nun and Magen Broshi on pickled sardine exports from Magdala, p. 7; and Chana Safrai and Joseph Frankovic on Jewish regulations of ritual purity, pp. 8-9; Thinking Like the Sages: Joseph Frankovic, “The Power of Parables” [Pesikta de-Rav Kahana 3:1; Lev. Rabbah 10:3; 4:5], pp. 10-15; Gospel Flora: Gloria E. M. Suess, “Beating the (Thorny) Bushes” [Mt. 7:16; Lk. 6:44], pp. 16-21; Halvor Ronning, “Why I Am a Member of the Jerusalem School,” pp. 22-27; “A Selective List of Books and Articles by Members of the Jerusalem School” (compiled by David Bivin), p. 28; Gospel Archaeology: Ronny Reich, “Six Stone Water Jars” [Jn. 2:6], pp. 30-33; “Sea of Galilee Museum Opens Its Doors,” pp. 34-37. Robert L. Lindsey Memorial Issue: Readers’ Perspective: Richard Rawe on the origins of the misnomer “Jehovah,” p. 7; Robert L. Lindsey, “Unlocking the Synoptic Problem: Four Keys for Better Understanding Jesus,” pp. 10-17, 38; Beth Uval, “Reading the Landscape: Neot Kedumim—The Biblical Landscape Reserve in Israel,” pp. 18-21; Beth Uval, “Streams of Living Water: The Feast of Tabernacles and the Holy Spirit” [Jn. 7:37-39], pp. 22-23, 37; Eight tributes to Robert L. Lindsey by his colleagues, students and associates: David Flusser, “How to Know Jesus? Follow Lindsey!” pp. 24-25; Halvor Ronning, “Practicing What He Preached,” p. 26; David Bivin, “Blessed Be the Faithful Judge!” p. 27; R. Steven Notley, “The Jesus Who Changes People’s Lives!” p. 28; Brad H. Young, “To My Teacher, Pastor and Beloved Friend,” p. 29; Joseph Frankovic, “A Doer of His Father’s Will,” p. 30; Ken Mullican, “Excerpts from a Eulogy,” p. 31; Dwight Pryor, “Jesus at the Center,” pp. 32-33; “Milestones in the Life of Robert Lisle Lindsey” [significant dates in Lindsey’s life], pp. 34-35; “The Writings of Robert L. Lindsey” (compiled by David Bivin), pp. 35-36. Readers’ Perspective: David Bivin on the question, “Does it matter which of the Synoptic Gospels was written first?” p. 8; and Nancy Johnsen on the reason for Mark’s substitution (opposite Lk. 23:46) of Ps. 22:1 for Ps. 31:5, p. 9; David Bivin, “‘And’ or ‘In order to’ Remarry” [Lk. 16:18; Mt. 5:31-32; 19:9; Mk. 10:11-12; Deut. 24:1; Gittin 9:10], pp. 10-17, 35-38; Sidebar: “First-century Bill of Divorce” [Wadi Murabba’at 19], p. 17; Mendel Nun, “Gergesa: Site of the Demoniac’s Healing” [Mt. 8:28-34; Mk. 5:1-20; Lk. 8:26-39], pp. 18-25; Thinking Like the Sages: Joseph Frankovic, “Stewards of God’s Keys” [Mt. 16:17-19; Isa. 22:22; Sifre Deut. 321; Ta’anit 29a; 2 Baruch 10:18; 1 Chron. 9:26-27], pp. 26-34. Readers’ Perspective: David Bivin on John 21:15-17 as an indication that the Gospel of John was originally composed in Greek, p. 7; Robert L. Lindsey, “Paraphrastic Gospels” [Mk. 1:2-3; 1:11; 15:34], pp. 10-15; Sidebar: “Reading Synoptically,” p. 15; Ze’ev Safrai, “Gergesa, Gerasa, or Gadara? Where Did Jesus’ Miracle Occur?” [Mt. 8:28-34; Mk. 5:1-20; Lk. 8:26-39], pp. 16-19; R. Steven Notley, “Anti-Jewish Tendencies in the Synoptic Gospels” [Lk. 12:11-12; 21:12-14; Mk. 13:9-11; Mt. 10:17-20; Mk. 3:19-21, 31-35; Lk. 8:21; Mk. 8:16-21, 32-33; Mt. 16:7-11, 22-23; Mk. 14:50; Mt. 26:56; Mk. 3:6; Lk. 6:11; Lk. 19:45-46; Mk. 11:15-17; 15:31], pp. 20-35, 38; From Moses’ Seat: Joseph Frankovic, “Esteeming the Jewish People” [Mt. 11:4-6; 24:36-42; Lk. 17:26-30], pp. 36-37. Readers’ Perspective: Douglas Hadfield, “Shorter Oxford English Dictionary Misses Hebraic Nuance of ‘And,’” p. 7; David Bivin on the question, “Did God the Father abandon his son Jesus?” p. 8; and Steven Notley on the Jerusalem School’s hermeneutical criteria, pp. 9-10; From Moses’ Seat: Joseph Frankovic, “The Nature of Jesus’ Task” [the messianic task as perceived by Jesus and John the Baptist], p. 12; Cats in Jerusalem: David Bivin, “Hendiadys in the Synoptic Gospels” [Gen. 12:1; 13:13; 23:4; 32:28; Lk. 2:47; 7:11; 21:15], pp. 14-15; New Discoveries: David Bivin, “One Torah Reader, Not Seven!” [Lk. 4:16-20], pp. 16-17; Mendel Nun, “What Was Simon Peter Wearing When He Plunged into the Sea?” [Jn. 21:7], pp. 18-23, 37; Shmuel Safrai, “Were Women Segregated in the Ancient Synagogue?” pp. 24-36. Readers’ Perspective: Steven Notley on the nature of Scripture and how it should be used in historical inquiry,” p. 8; and Randall Buth on canon, inspiration of Scripture, textual criticism and “reconstructed” sayings of Jesus, pp. 9-10; New Discoveries: David Flusser, “Ostracon from Qumran Throws Light on First Church” [War 2:122-123; Acts 4:32, 34-35], pp. 12-15; Mendel Nun, “The ‘Desert’ of Bethsaida”[Mt. 14:15; Mk. 6:35; Lk. 9:12], pp. 16-17, 37; Gospel Flora: Gloria E. M. Suess, “Enemies of the Harvest” [Mt. 13:7; Mk. 4:7; Lk. 8:7], pp. 18-23; “Excerpts from David Flusser’s Jesus,” pp. 24-27; David Bivin, “The Discomposure of Jesus’ Biography” [How the stories in the Life of Jesus’ lost their chronological order and original contexts], pp. 28-33; “JP Ten-year Index (1987-1997),” pp. 34-36. David Bivin editorializes on the identification of Bethsaida, p. 3; Readers’ Perspective: David Bivin on the Hebrew word midbar (desert) in the sense of “a pasturing place,” pp. 8, 10; Shmuel Safrai on the Jewish population of the Golan (Gaulan) and the northeastern and eastern coasts of the Sea of Galilee, pp. 10-11; and David Bivin on the possibility that the Gergesene demoniac (Lk. 8:38) was Jewish, p. 11; Mendel Nun, “Has Bethsaida Finally Been Found?” pp. 12-31; Risto Santala, “The Jerusalem School and Its Theory,” pp. 32-33;From Moses’ Seat: Magen Broshi, “From Allegro to Zeitlin,” pp. 34-35; Joseph Frankovic, “The Best Long-term Investment—Making Loans to God” [Mt. 6:19-20], pp. 36-37. 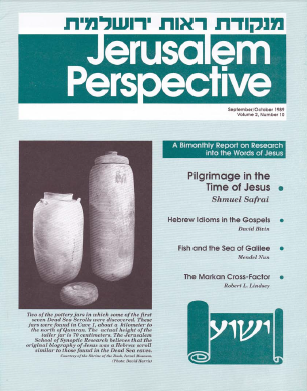 [Typo: cover shows 1998]:Readers’ Perspective: David Bivin on the pidyon haben (redemption of the firstborn) ceremony in ancient rabbinic sources, p. 6; Randall Buth on the methodology of the Jerusalem School of Synoptic Research as it pertains to the interdependence of the Synoptic Gospels and their hypothetical sources, pp. 7-8; on Gematria, and on the supposed theological bias of Westcott and Hort’s Greek text of the New Testament, p. 8; on the Textus Receptus, or “majority text,” theory, p. 9; and Joseph Frankovic on the dangers of allegorically interpreting Jesus’ life and teachings, p. 9; Following Jesus: Dwight Pryor, “Walk after Me!” pp. 10-11; Shmuel Safrai, “The Synagogue the Centurion Built” [Lk. 7:1-10; War 7:216-217; Acts 10:1-4], pp. 12-14; Cats in Jerusalem: David Bivin, “Noun Chains in the Gospels” [Mt. 5:3, 8; 6:26, 28, 30; 8:20; 10:5; 13:31, 50; 19:14, 23: Lk. 8:23], pp. 15-17; David Flusser, “A New Portrait of Salome” [Mt. 14:3-12; Mk. 6:17-29;Antiq. 18:116-119], pp. 18-23; Joseph Frankovic, “God’s Mercy and Our Disobedience” [Ta’anit 25a; Rom. 11:30-36], pp. 24-25; The Meturgeman[translator]: Randall Buth, “Deliver Us from Evil” [Mt. 6:13b], pp. 29-31; Book Review: Joseph Frankovic’s Reading the Book: A Popular Essay on Christian Biblical Hermeneutics, reviewed by Archie Wright, pp. 32-33; Shmuel Safrai, “Insulting God’s High Priest” [Acts 23:5], pp. 34-37; From Moses’ Seat: Joseph Frankovic, “Emulating the Ways of Sodom” [Avot 5:10; Ezek. 16:49], p. 38. Readers’ Perspective: David Bivin on whether there existed a belief among Jews of the first century that the Messiah would be deity, p. 6; Following Jesus: Dwight Pryor, “Learning Is for Life” [Jn. 8:32], pp. 8-9; Shmuel Safrai, “With All Due Respect…” [One aspect of the etiquette governing the teacher-disciple relationship: To what extent could a disciple differ from the opinions of his teacher? Eduyot 1:12-14; Sifre Deut. 31; Mt. 5:27, 32, 34, 39, 44], pp. 10-13; Ronny Reich, “Design and Maintenance of First-century Ritual Immersion Baths,” pp. 14-19; David Bivin, “The New International Jesus” [Acts 21:40; 22:2; 26:14; Jn. 5:2; 19:13, 17, 20; 20:16; Rev. 9:11; 16:16; Mt. 9:20; 23:5; Lk. 8:44; Num. 15:37-41], pp. 20-24; David Flusser, “Parables of Ill Repute” [Ta’anit 25b; Lk. 11:5-8; 18:2-8; 16:1-9], pp. 25-27; David Bivin and Joseph Frankovic, “Us and Them: Loving Both” [Mt. 5:43-45; 1QS 1.3-4; 9.21-23; War 2:139; Lev. 19:17-18], pp. 28-31; David Bivin, “Medieval Jargon on First-century Lips” [The anachronistic use by some Christian teachers of remez (hint), one of four modes of kabbalistic scriptural interpretation, collectively referred to as Pardes], pp. 32-35; Book Reviews: Joseph Frankovic’sThe Kingdom of Heaven, reviewed by Loren Huss, p. 36; Brad H. Young’s The Parables: Jewish Tradition and Christian Interpretation, reviewed by Richard W. Purcell, p. 37.